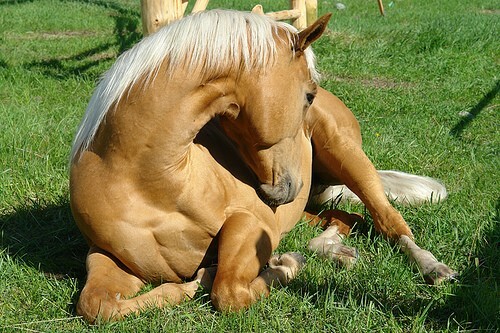 Most horse people have unfortunately had the experience of having one of their horses colic. Generally most resolve with minimal treatment and veterinary intervention may or may not even be necessary. Many colics simply resolve by walking the horse for 20-30 minutes. Sometimes, however, symptoms do not respond with conservative measures. Let’s focus on what to do and what to expect when it is necessary to refer your horse to our hospital for additional intensive medical management or surgical treatment. Deciding whether or not you would hospitalize your horse is best discussed with us and the barn staff before your horse colics. It allows you to gather the facts, analyze the costs and enables you to make a practical rather than emotional decision. Though many factors could influence this decision it is best to be familiar with the process beforehand. Having a reasonable idea ahead of time will make the decision much simpler if it comes to pass your horse needs referral. 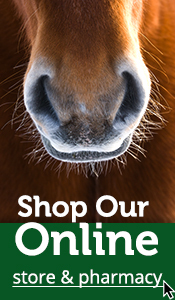 Our in-the-field or ambulatory recommendation to refer your horse is not always easy. 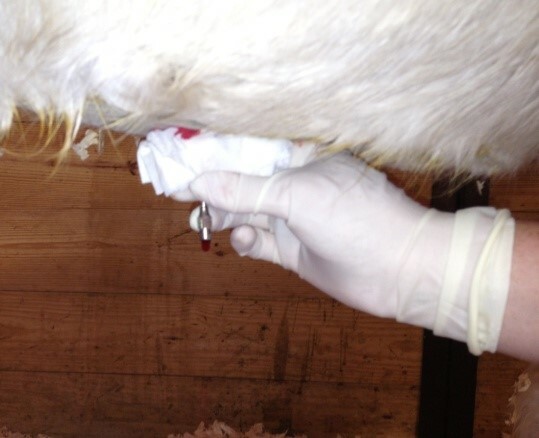 Very often with a protracted colic case, a definitive diagnosis is not available until an abdominal ultrasound, blood and serum analysis and often abdominocentesis ( at right) can be performed at our hospital. We base whether to refer into the hospital on the degree of pain, the vital signs, the rectal exam, amount of gastric reflux, and a lack of response to initial analgesic treatment(s). Sometimes a horse that was colicky when leaving the farm is perfectly normal when arriving at the hospital after a bumpy trailer ride. If your horse’s clinical signs deteriorate and its initial response to treatment warrants hospitalization, it is better to hospitalize sooner and rule out surgical diseases as soon as possible to provide the best possible prognosis. Cost, in most cases, is one of the biggest concerns when referring a horse. Hospitalization and the additional diagnostic procedures and intensive medical care of a complicated medical colic (IV fluids, pain medication, and oral fluids) can typically range between $1250 and $3000 depending on the length of hospitalization and care. If surgery is required the costs can run anywhere from $5,000 to $10,000 to 15,000 depending on the type of problem and any post surgical complications and length of accompanying hospitalization. We are currently referring our surgical patients to board certified surgeons. Prognosis for various surgical diseases varies widely depending on the viability of the affected abdominal viscera and whether a resection is necessary due to strangulation or incarceration of visceral organs. These factors affect the prognosis for both for life and for return to athletic ability. If medical management is all that is required, the prognosis is generally good but may require protracted therapy as in the instance of right dorsal colon ulceration. Over the last decade the prognosis for survival has dramatically improved. 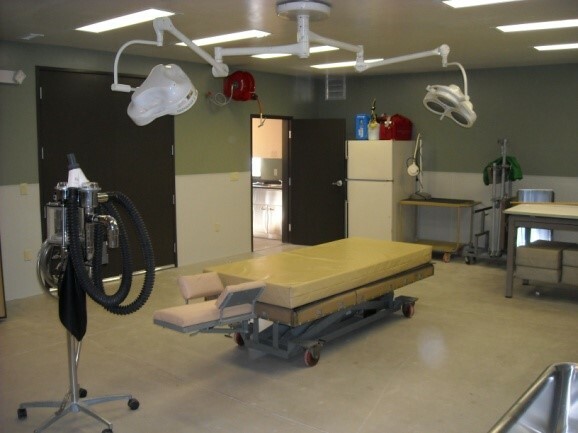 Our clinical staff will attempt to answer all your questions before you leave the hospital to the extent possible, and in the event your horse goes to surgery we offer our surgical viewing window so you can monitor the events as information comes available. 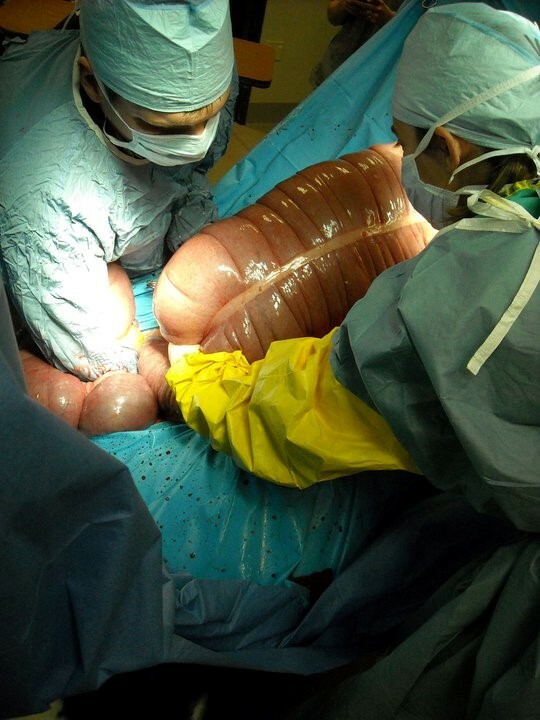 No compromised bowel and a simple re-arrangement of the intestines was required (displacement). No compromised bowel but an incision into the intestine was required (impaction). Many of these are actually successfully treated medically without surgery. Mild to moderate compromise of the bowel but intestine doesn’t need to be removed (twist/torsion/strangulation). 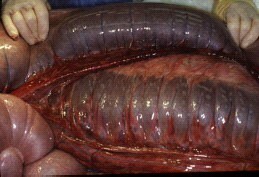 Moderate to severe compromise of bowel and intestine and resection (twist/torsion/strangulation/perforation) (picture at right). Our hospital is easily accessed off highway 82, just 2 miles up-valley on the Catherine Store frontage road. Most medical colics will stay at the hospital at least overnight so plan on a return trip to go pick up your horse. Our new state-of-the-art security camera system allows owners to log into our system with a provided password to visualize your horse on the web once you’ve gone home. Once your horse arrives do not forget to notify your insurance company to facilitate payment in the future.